We’re still three episodes away from Star Trek: Discovery‘s season two finale, but details are beginning to emerge about the direction the series may be taking for season three and beyond. Possible Major Spoilers to Follow! If you’ve watched recent episodes of Discovery then you already know the show has been all about time travel this season. Burnham’s long lost mother was recently revealed to be the Red Angel, a time traveller attempting to prevent a cataclysm by stopping a rogue artificial intelligence from the future from altering the past and present. It’s all very Terminator on paper, but Star Trek as a franchise is no stranger to time travel stories – and by the sounds of it Discovery will be going all in on this well worn Trek trope. According to multiple sources with knowledge of the production (which shoots right here in Toronto), the Star Trek: Discovery finale will make quite the trek – we’re about to see the crew of the USS Discovery transported to the far future. This change will thrust the show roughly 500 years ahead from the pre-Original Series setting timeline the show currently inhabits to centuries after Voyager and the Next Generation films. This appears to confirm a long rumoured fan theory (recently discussed in detail by our friends from Highly Logical – A Star Trek Podcast), which started circulating after the “Calypso” Short Trek episode depicted the USS Discovery adrift and abandoned in the 33rd century. The game-changing new direction for Star Trek: Discovery also lines up with recent comments from showrunner Alex Kurtzman and the show’s cast made at PaleyFest last week, specifically related to the conspicuous absence of events and characters from Discovery in later Star Trek continuity. Sounds about right! Why does Spock never mention Burnham? Why aren’t the exploits of Discovery‘s crew heralded in Next Generation or Voyager? If things play out as reported then we’ll have our answer. We reached out to Kurtzman’s reps to comment on the rumour last week, but haven’t heard back. The alleged outcome of this season’s time travel arc makes sense both creatively and canonically. 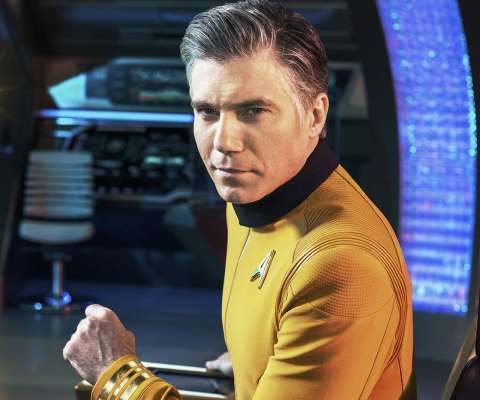 Discovery as a series is sandwiched between two other shows in Star Trek history – Enterprise and The Original Series – and it’s already butting up against the latter with the appearance of the USS Enterprise and the inclusion of characters like Pike and Spock. By jumping the ship and the show into the uncharted territory that is the 28th century – a completely unexplored time period in Star Trek canon – the showrunners then won’t have to spend so much time retconning established events, characters, and technology in an effort to please fans. The move also opens up new creative frontiers for the show’s writers. Stranding the USS Discovery in the future where the United Federation of Planets and Starfleet may not even exist essentially turns the show into “Time Voyager”. Same ship, same crew, but an all new time and place to explore without having to worry about stepping on the toes of the captains and crews who’ve boldy gone before. Discovery‘s producers will then be able to tell their own stories, unconstrained by established canon. All of this stacks up with old reporting on some of former Disco showrunner Bryan Fuller’s initial concepts, which envisioned the show more as an anthology series along the lines of America Horror Story, a grand narrative that would eventually jump from the pre-Kirk era all the way to the post Next Generation / Deep Space Nine / Voyager era. Fuller may have moved on, but many of those pre-production ideas continue to be mined by Discovery‘s current writing staff. In fact, this may well have been part of the plan all along. We think this is a genuinely exciting move for Star Trek: Discovery, which has struggled to please longtime Trek fans for most of its run yet remain skeptical about whether or not this drastic change will be handled well. To date the show has been hit and miss with its reveals and plot twists; when they work, they work well, but more often than not these big revelations have tended to fall flat (ie., most of the Mirror Universe arc and Ash Tyler’s double life). However, full credit must be given to the writers of Discovery‘s second season thus far, as this season has been a massive improvement on the first. We’re still not entirely confident that Discovery has found its footing well enough to make this temporal change work, but for many of the reasons outlined above it may simply be the best decision for the series at this point.